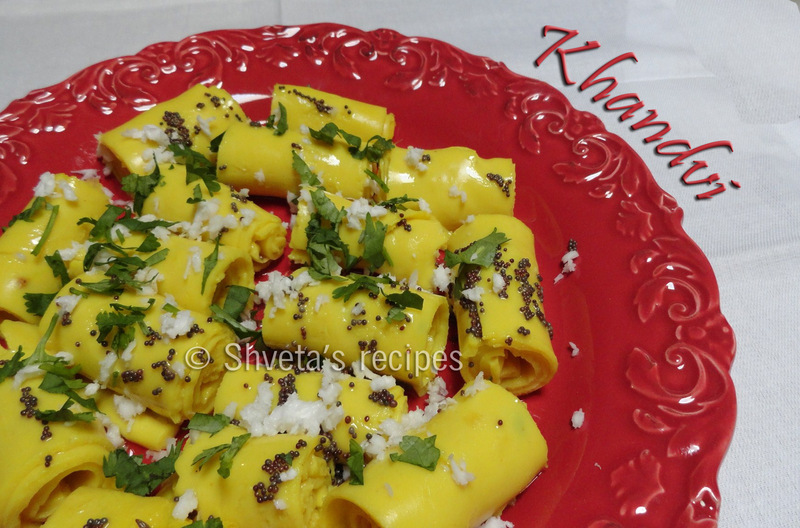 Khandvi is a very delicate Gujarati snack. It takes little patience and practice to make these beautiful rolls. But it’s worth trying. In a large bowl, add sieved besan, ginger paste, green chili paste, turmeric powder, asafetida powder and salt. Now add yogurt and water to it. Mix thoroughly. There must be no lumps and batter should be smooth. In a thick bottom pan, cook this batter, stirring continuously. It starts to thicken. Keep stirring for approx. 5 minutes or till done. Now keep the back of two steel thalis or any other large smooth area ready. Take some batter on the back of each of these thalis and quickly spread them in very thin layer. Let it cool for 2-3 minutes. Then slice them with knife into 2 inch long stripes. Roll each stripe gently and arrange these rolls neatly in a serving dish. For tempering, heat oil in a pan and add mustard seeds. When mustard starts splattering, add curry leaves and chopped green chilies. 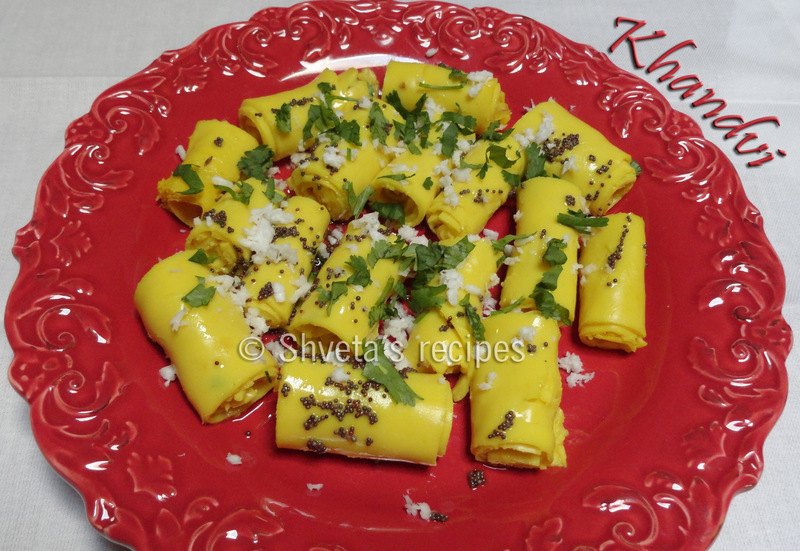 Sauté for a minute and pour it evenly on the rolled Khandvi. Garnish Khandvi with fresh grated coconut and fresh chopped cilantro. Serve immediately. Can u make it the day before. To serve the next day? Avitha, I haven’t tried it the next day. Usually it gets over the day I make it:)).